Some of the fiercest supporters of a brand are its own employees. Yet, the power of employee advocacy is quickly forgotten by many organizations. Many employee advocacy statistics demonstrate the power of a firm’s workforce. We have written extensively about the subject, most recently with What Is Employee Advocacy? | Everything You Need to Know. Here we look at the proof of the effectiveness of employee advocacy, despite it still being in its infancy. 10. 39% of Job Seekers feel at least a Bit Encouraged by Their Employers to Check Email after Hours. 12. 51% of Large Companies have a Centralized Department That Sets Rules and Manages External Communications through Social Media. A survey by Hinge Marketing discovered significant differences between those in formal employee advocacy programs and those in no formal program. Those in a formal program clearly spend more time socially promoting their employer, than other workmates. 58.8% of those in a program spent more than 5 hours per week socially promoting their employer, with 39.2% spending less than five hours online. 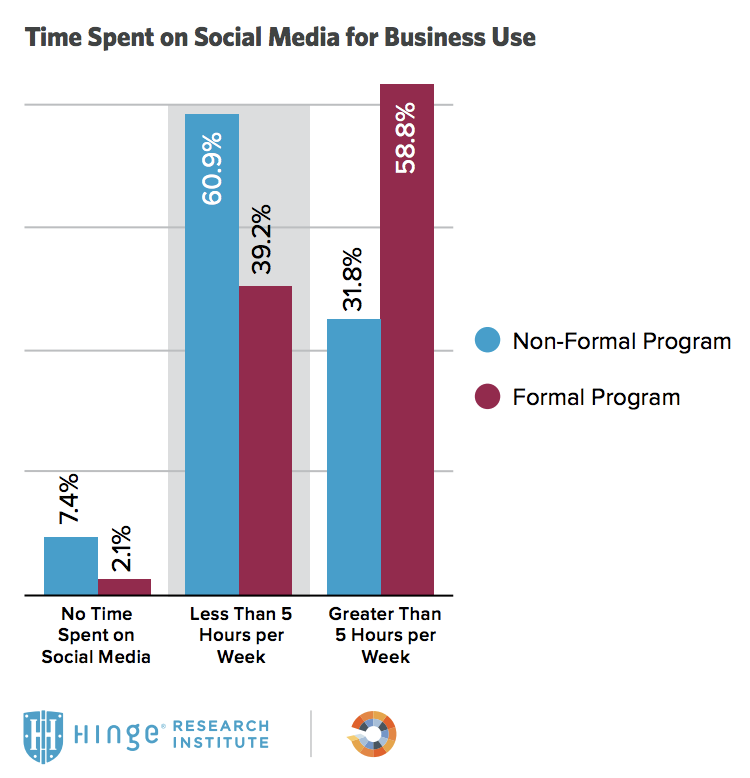 For those in a non-formal program, however, only 31.8% spent greater than five hours online, compared with 60.9% devoting less than five hours per week to business-related social media. A survey taken by The Marketing Advisory Network showed a clear difference between the generations when it came to sharing information about their workplace. 81% of Millennials share information about their job, compared to 72% of Generation Z and a mere 47% of Baby Boomers. 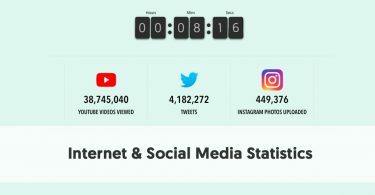 This statistic is similar to general uses of social media by the different generations. With Baby Boomers not growing up with social media, many still have no interest in using it now. According to results from the Kredible Employee Advocacy Study, employee advocacy programs that involve at least 1,000 active participants can generate $1,900,000 in advertising value. They found that employee advocacy could deliver the same exposure as an advertising program, but at a fraction of the cost. People take more notice of credible they feel they can trust rather than any human in an advertisement. Recent Glassdoor research into HR and recruiting stats in 2018 have found that 93% of employees/job seekers say it is important to be thoughtful and informed about all aspects of a company (e.g., culture, values, mission, business model, future plans, pros and cons about the workplace) prior to accepting a job offer. Obviously, they will take notice of companies with positive employee advocacy, along with good ratings on sites such as Glassdoor. Career Arc carried our research into The Future of Recruiting. One of their findings was that job candidates took much notice of reviews about a company. The majority (55%) of Job Seekers reported having abandoned a job application after reading a negative review about that employer. Notably, the same percentage of employers says they neither monitor nor address negative comments on social media and review sites. According to The Marketing Advisory Network survey, 22% of the employee respondents with doctorates undertake employee advocacy daily, 28% occasionally, and 22% once a week. The number of employees participating frequently drops at lower education levels, however. Only 14% of Master’s graduates undertake employee advocacy daily, as do 8% of those with bachelor’s degrees, 13% with associate’s degrees, and just 3% of those with high school diplomas or the equivalent. In the case of the least educated employees, 25% say they engage in employee advocacy occasionally, 15% do so once a week, but 57% never engage on behalf of their workplace. The Career Arc’s The Future of Recruiting report found that 32% of Job Seekers report they have shared at least one negative review of a previous or prospective employer. Those who leave negative online reviews are 66% more likely to spread those opinions on social media, compared to those who only convey their views directly with a friend or colleague. Another finding from The Future of Recruiting report is that job seekers trust a potential employer’s current staff ahead of anybody. When asked to rank various groups/factors from 1 (least trusted) to 7 (most trusted) current employees top the list, with an average score of just under 5. In descending order of trust, they would also trust reviews by job seekers, former employees, company website, news coverage (all with averages near 4), recruiters, and CEOs and recruiters (averaging just above 3). Jobvite’s 2017 Recruiter Nation Report found that 28% of 18-29-year-olds use Instagram to preview companies that interest them. This compares with 25% who use Facebook and 23% you use the more traditional LinkedIn. Jobvite’s 2017 Recruiter Nation Report reports 45% of job seekers check their work email after hours every day, with 39% claiming they feel at least a bit encouraged by their employers to check email after hours. 51% of young professionals, 23-39, check email after hours. The figure is even higher for those working in real estate, with 85% continuing to check their emails outside their official work hours. PostBeyond surveyed management throughout Canada and the US (350 businesses in each country) on their usage, perceptions, and policies regarding social and mobile communication technologies in the workplace. 49% admitted to operating some form of employee management program. 38% said they did not run such a program, and the remaining 13% of respondents didn’t know what their company operated. PostBeyond found that 51% of the surveyed firms had one department that set the rules and did all the external social communication. A further 21% had a central department to set the rules, but allowed other departments to undertake their own communication. In 15% of respondent firms, a range of departments set the rules and provided their own external communications. 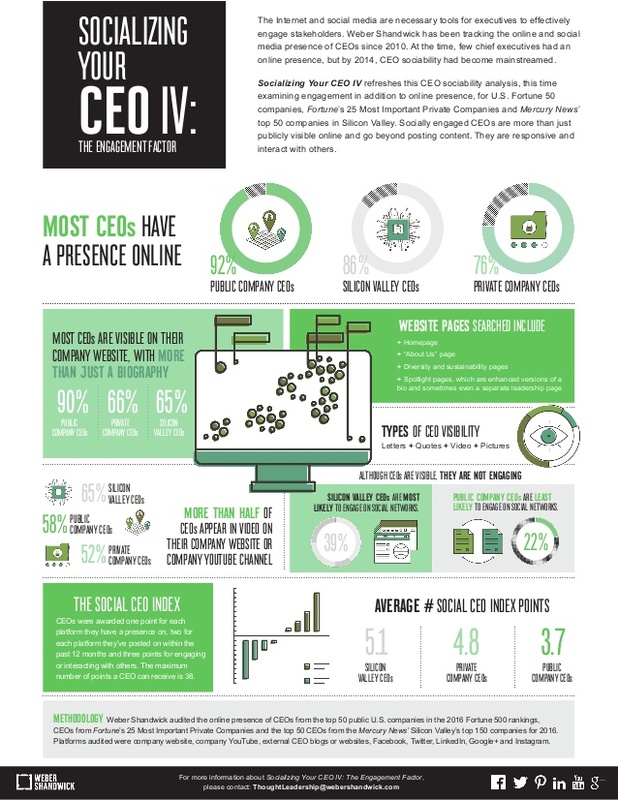 According to the findings of Weber Shandwick’s Socializing Your CEO IV, the majority of both public and private company CEOs had a presence on at least one of the online platforms Weber Shandwick audited (92% and 76%, respectively). However, numbers were not so impressive when you look at their online sociability. Just 38% of CEOs (in both sectors) had posted in the past 12 months. Even less admit to having engaged online, i.e., interacted with others (22% vs. 34%, respectively). Another finding from Socializing Your CEO IV is that 14% of private company CEOs and 2% of public company CEOs have written op-eds for The Wall Street Journal. Some of the op-eds relate to the CEO’s business directly, others from the survey were about topics not directly related to the company’s line of work, such as freedom of speech, gender diversity, and the American presidential election. According to data sourced via Jobvite, 47% of people hired through employee referral stay longer than 3 years. This compares to 39% of those who are recruited from a career site and just 14% of those appointed via a Job Board. According to the PostBeyond survey, the most common type of item shared are reports on company achievements – 31% of respondents. 30% share events organized by the company, 26% their personal achievements, 24% promotional messages, 24% company mentions on the news and 21% items of industry news. 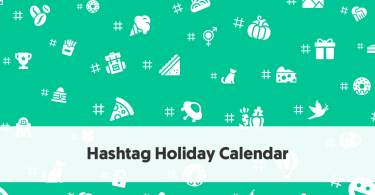 When the respondents to Hinge Marketing’s employee advocacy survey were asked about how their firm measured the success of the program, the most common form of measurement was by growth in social followers – 60.2%. 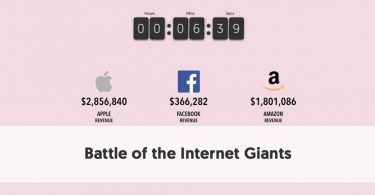 Impact on website was also popular, with 56.7% using this as a measuring tool. Other popular measurement factors include the number of leads from social channels (39.6) and increase in social chatter about your brand (38.5%). Only 4.6% of respondents admitted to not measuring the success of social media engagement. 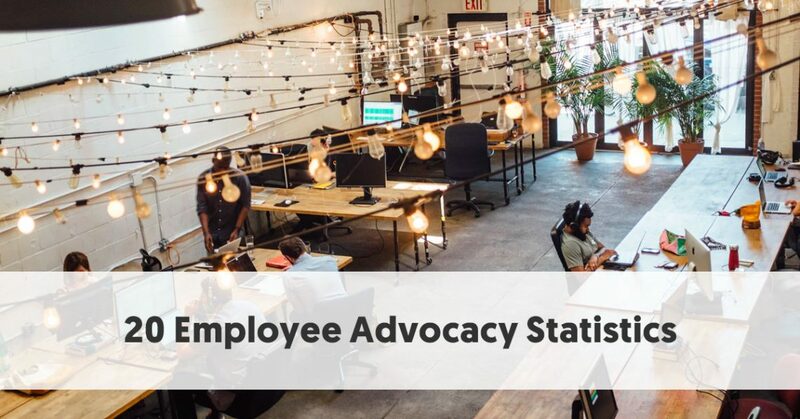 Employees who have been with a company for less than a year are much more hesitant to engage in employee advocacy, according to The Marketing Advisory Network survey. 63% of new employees report they never share company messages socially. This compares with 54% for people who have worked for a company for 1-3 year. More experienced workers are more comfortable with sharing company messages, however, with only 2% against the idea. Career Arc’s The Future of Recruiting asked employers about the various methods they use to recruit talent today. 91% of employers admit to using social network to hire talent today. This compares to 89% for employee referrals, 81% job boards, 72% job advertising, 67% recruiting events, and 41% recruiting agencies. Job seekers were also asked how useful they found each of these recruiting methods. Although their support was lower overall, they also favored social /professional networks, with 55% seeing them as being useful. Their other results were job ads 44%, job boards, 37%, recruiters 33%, employee referrals 30%, and recruiting events 16%. As part of their survey, Hinge Marketing asked employees who participated in employee marketing what benefits they received from their involvement. The most significant benefit was an expanded professional network, with 87.2% recognizing this. 76% believed that it helped them keep up with industry trends. Also, 50.4% felt it helped them attract and develop new business, and 48.6% thought it provided opportunities for professional partnerships.